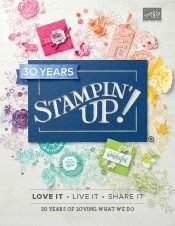 Do you feel a little stale with your scrapbooking? Has your Mojo gone on holiday? Why not challenge yourself to try something new! "And how do I do that?" I hear you say? Well, there are many ways to stretch your paper craft skills and give you a renewed desire to scrap. NEWS FLASH: Stay tuned for a personal scrapping challenge I have set for you at the bottom of this page! One of the best ways I have found to stretch my papercrafting skills is to get together with some friends who also scrap and ask them to dare me to try something new in scrapping, and to go ahead and name the dare! Try to scrap the way a friend does. Study his/her work and see if you can make a layout with some of your own photos using his/her methods. Study some magazine pages that you really like and base your layout on them. Magazines lay out their pages a bit like a scrapbooker does, for maximum impact. Use a different medium than you would normally use on your page. If you have never scrapped a piece of velvet or lace into your pages, try that. 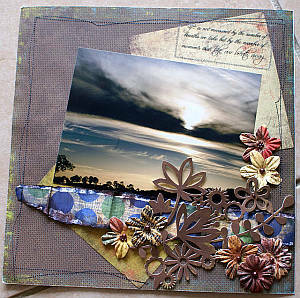 Or choose to use inks, paints, crackle mediums, texture mediums, embossing, etc on your page to give it a 3-d effect. Start a Circle Journal with some friends and study their entries into your journal. Instead of mailing your albums to each other, another way to have a Circle Journal swap is to decide on the theme for your journal and just send each other a page for every member's album. This saves on postage, you keep your album at home at all times so it cannot be lost, and you still get to study each other's techniques. Limit yourself to only five elements for a page layout and see if you can make a page that satisfies you with just them. Scrap something unusual - an empty Ferrero Roche box, an empty Pringles tin, or a picture frame for example. I even embellished a bra once to raise awareness for a breast cancer cause scrapbooking day! Here's an example of someone else's decorated bra. 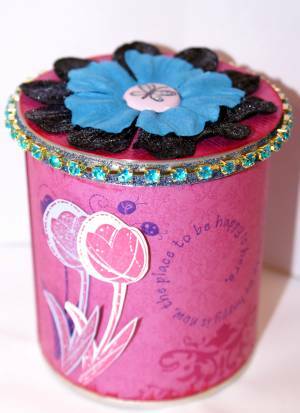 Make your own embellishments. 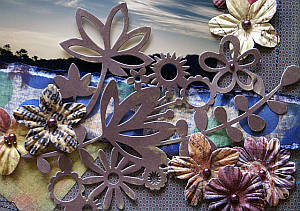 Try making your own paper flowers or build an element out of punched shapes. 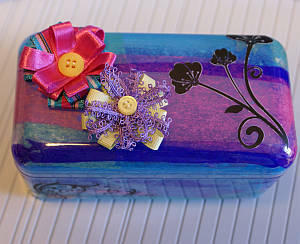 Or alter some store-bought elements by inking them, embossing them, stamping them or treating them in some other way. Start with a quote you like, then choose the pictures and elements to scrap with that quote. If you normally scrap chronologically, give yourself permission to scrap something you have been wanting to do that ius outside of your own self-imposed timeline. Sometimes we create rules for ourselves that don't always suit our needs and interests, you know? I trust you now have some ideas to use to challenge yourself to something new in scrapping. If you have more ideas that have allowed you to challenge yourself, please do add them here to inspire me. We all need fresh inspiration! And if you take on my personal 16 week challenge as listed above, I would love to see the layouts you make. Go on - I dare you!